On Easter Day, 1970, the Primate, the Most Rev’d Philip Strong announced the appointment of the Right Rev’d Bruce Rosier, Auxiliary Bishop of Perth, to be our fourth Bishop. Bishop Rosier was installed in St Augustine’s Church, Port Augusta, on June 4th. In his first Report to the Synod in October 1970 Bishop Rosier recognised the work and responsibility of Jim Curyer as caretaker, and because the title did not reflect adequately all that he was called upon to do, had appointed him as Warden from 1st July. Camps for school children continued to be held each year in the August/September holidays, under the general title of “Camp Conqueror”. One of the traditional activities was to climb Mt Remarkable, and a certificate to mark the achievement was awarded to each person who reached the summit, 3146 feet (960 meters)above sea-level. Bishop Rosier happened to visit the Camp on a mountain-climbing day and became the first bishop to receive Camp Conqueror’s certificate. A total of 134 children participated in the Camps of 1970. In addition of course were the leaders and cooks. Other events held at the Conference Centre – as it was then unofficially called – included Lay Readers’ Study weekends, a Music Camp, Mothers Union Annual Council Meetings and Clergy Conferences and Retreats. A new Community Room was built in the early part of 1971 under the supervision of the Warden Jim Curyer. Contractors laid the concrete floor and did the electrical wiring, and an enthusiastic group from Port Pirie put the roof on in one day. Jim and his helpers did the rest. The building is a basic structure of iron, and inlined, but adequate for the kind of activities envisaged, e.g. indoor games when the weather is inclement. The total cost was $3,700. “This Diocesan Centre is due to the vision and determination of the former Bishop of Willochra, Thomas Edward Jones, M.B.E., Th.L. The land was a generous gift in 1960 from Mr and Mrs L S Bishop, of Melrose, and the Centre was opened by the Archbishop of Melbourne, The Most Rev’d F Woods, on Sunday June 11th, 1961. 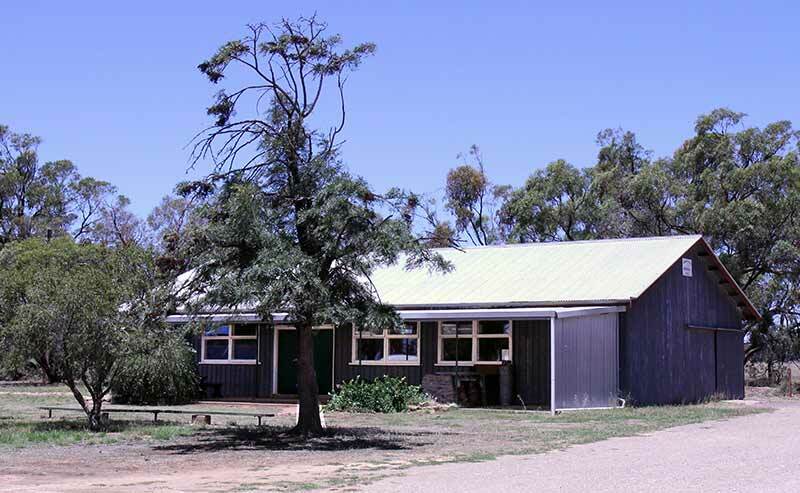 Various buildings and facilities were gradually acquired – one dormitory is in the memory of Nicholas, a student who died when he was lost in Wilpena Pound, and another is the gift of Mrs Brown and other friends of Bishop Jones in the USA. The first Warden, Mr J J Curyer and his wife worked with devoted care to build and improve the Centre in these early years. The Chapel of Christ the King and the Library were the gift of our link with the Diocese in the USA, the Diocese of North-West Texas, whose Bishop, the Right Rev’d George A Quaterman, came here for the Consecration of the Chapel on Sunday May 11th 1969, Shortly before Bishop Jones retired. If you seek his memorial, look around you. Regrettably this Memorial Record and the portrait were lost in the fire of August 1975. The Warden, Jim Curyer retired from the position at the end of 1973 after 12 years of faithful service. At the beginning of 1974, Matt Matthews and his wife Dorcas became the new Wardens. Matt and Dorcas originally came from Wilmington and Melrose respectively but had been living in Adelaide for about 30 years. At the Annual Council of the Mothers Union in 1973 members undertook to work tapestry kneelers for the Chapel. The following year kneelers, canvas, designs and wool were distributed to participants in the scheme, and others urged to participate. Each kneeler has a centre-piece with designs linked to illustrate elements of the life, worship and work of the Diocese, and all have the same green background. There were to be 22 to go around the Communion Rail and one each for the prayer-desk and Bishop’s chair. They were dedicated at the Eucharist on the occasion of the Annual Festival and Council Meeting on April 21st, 1975, in the presence of Mrs Susan Varah, the Central President of Mothers Union, as well as Mrs Stirling and Mrs Bleby, Presidents of Adelaide and The Murray respectively. The Diocesan Chaplain, Canon Shelby-James was the celebrant and Bishop Rosier preached the address. This is how “The Willochran” of September 1975 recorded the disaster. At about 12:45 am on Wednesday 13th August, Mr Mat Mathews, our Warden, noticed, from his house, a light down at the Centre. The corner of the kitchen was burning and within a few minutes that building was ablaze. The E.F.S. units from Melrose and Wilmington, and lots of volunteers were quickly on the scene and saved the fire from spreading to other buildings, but the kitchen and dining room were completely destroyed. Risdon Park High School was in camp and the Warden and teachers quickly woke the children in the two nearby dormitories and moved them and their things out of danger. The fire destroyed everything in the burnt building – stoves, fridges, deep freeze, chairs, tables, pots, pans, cutlery, crockery, cupboards. It is awful to see, in the debris of the building, the ashes and twisted wreckage of so much hard work and loving care over the years. Tables – given by many Ladies’ Guilds, the memorial plaque and photo of Bishop Jones, pictures of Melrose and Port Pirie, the kitchen urn: all special gifts with their own story and value, were gone. All the electricity was controlled from the switch board on this building and had to be cut off by the E.T.S.A. Not only did the local men turn out very quickly with the EFS units but several of the local women also worked with Mrs Matthews to get campers’ breakfast at the Melrose Institute hall as there was not even a plate or spoon or cup that could be used. Bishop Bruce Rosier and the Treasurer, Mr Richard Geddes, are agreed that we must re-build as soon as we can. The insurance which had been re-adjusted this year will not cover costs in an inflationary time and we will need the gifts and support of the Diocese to re-build. We also need your help if you have any ideas for the design to make the kitchen and dining-room as next, useful, practical, and attractive as possible and not too dear. 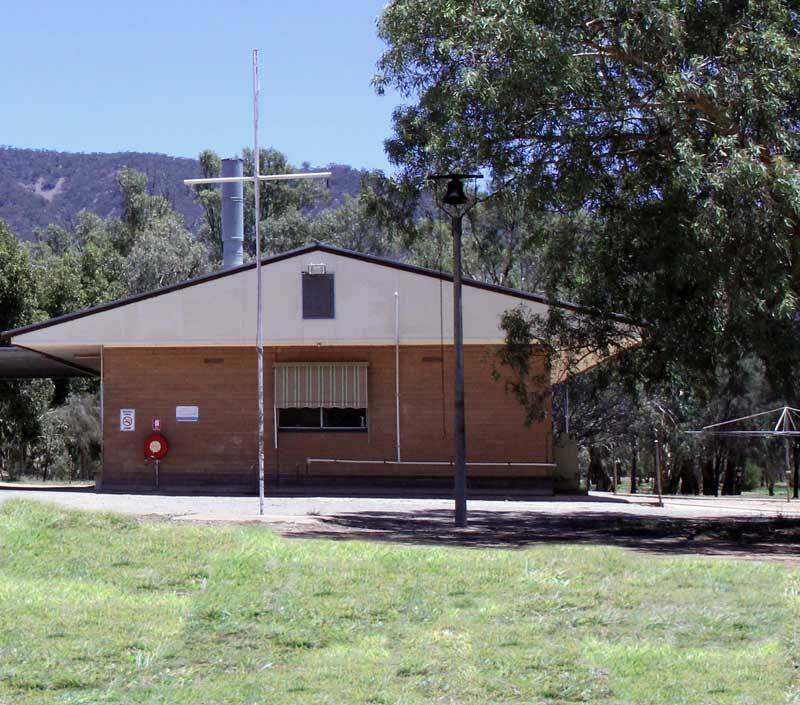 The Roman Catholic Bishop of Port Pirie, Bishop Bryan Gallagher rang our Bishop to offer his regrets on the loss caused y the fire and offered the use of their Youth Centre at Pekina for any groups who would like to make use of its facilities. So also did the Rev’d C R Hore, Methodist Minister at Burra, likewise offering the use of their facilities in the former Methodist Church at Redruth, Burra. Even if the groups are not able to use these other places, how kind it is to have them offered to us! The Diocesan Council immediately arranged for the rebuilding of the block, and bought new stoves (electric! ), cool-room freezer, crockery, cutlery, pots and pans, These were installed in the Bishop Jones Hall as a temporary kitchen and dining-room. By October rebuilding was under way, with local builder Mr Clair Prosser being the successful tender. The building was to be of sound construction, with a concrete floor. The windows at the end of the dining-room face Mount Remarkable. Many gifts of equipment and money were gratefully received. The electrical work was the gift of three electricians from Port Augusta and Port Pirie. The new building was in use by April 1976. There was joy in the air at the opening of the new Kitchen-Dining Room at the Diocesan Centre on Sunday 9th May. Hymns of praise swelled to accompaniment of the Port Augusta Brass Band. The window walls of the chapel enabled them and the overflow of the 250-strong congregation, seated outside, to feel part of the service. At the end of the Holy Communion the clergy and congregation gathered at the new building where Bishop Rosier thanked the many people who had helped in the design and rebuilding, both voluntary and paid workers. The Bishop thanked, especially, the people of Melwose who had relinquished their places on the local builder’s work list so that Mr C Prosser could begin the rebuilding so promptly after fire destroyed the former Kitchen-DiningRoom last August. It was a proud moment for Mrs Jones, widow of the third Bishop of Willochra, Rt Rev’d TE Jones, from whose inspiration the Diocesan Centre first came into being. Mrs Jones in presenting a new portrait of her late husband, said how pleased and proud she was that Bishop Jones’ dream had become a reality and was continuing to grow with the care and work of so many people. Mr David Gamlen, chairman of the Diocesan Centre Management Committee, introduced the former Archbishop of Adelaide, Dr TT Reed, who unveiled a commemorative plaque and blessed and opened the building. Dr Reed spoke of the Centre as a place of quiet retreat – a place for listening to God. He hoped that it would flourish and go forward as a “spiritual powerhouse”. After the opening the congregation inspected the well-designed, concrete-loch building with its wide eves and concrete paths. 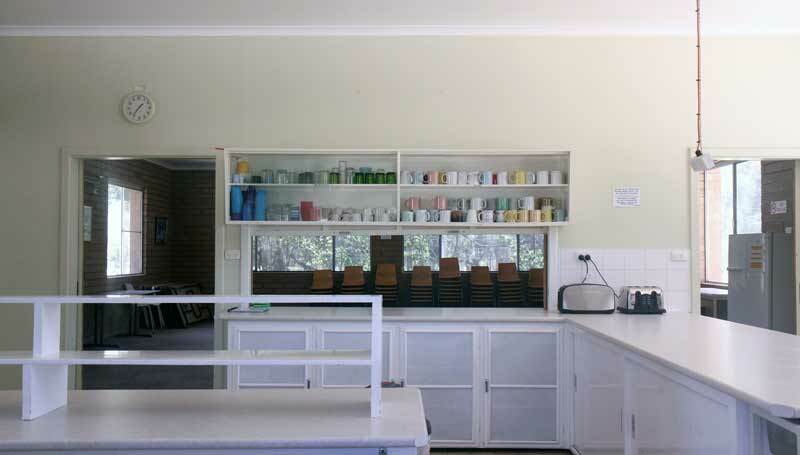 Inside, the Kitchen and its ample cupboards, sinks, stoves, and cool-room were much admired and put to good use in the making of cups of tea and coffee for the many people who enjoyed a picnic lunch in the grounds. To this time, the oversight of the Centre has been by the Diocesan Council. At its meeting on 15th November 1976, when the Diocesan Council set up its various Committees for the ensuring Triennium included was the “Diocesan Centre Management Committee”, comprised of the Bishop, Canon DA Richards-Pugh (the Registrat), and Messrs LS Bishop, D Gamlen (Chairman), M Matthews (Warden), and HK Wilkinson. The Warden of the Centre, Matt Matthews, retired from that position on 15 april 1979, having with his wife Dorcas, cared for the Centre for five years. Mr John Clarke of Para Hills, with his wife Wendy and their three children, took up his appointment as Warden in May, 1979. Despite the inconvenience of the change of Warden, the Chairman of the Committee reported that the Centre had been in almost constant use throughout the year, with 62 groups making use of its facilities. A coin-operated telephone was installed in the Dining-room. The history of Camp Willochra was compiled by Canon Ian Barlow. © Camp Willochra 2018 All Right Reserved.